The Corinium Museum in Cirencester, once Roman Britain's second biggest town, reopened in 2005 after a stunning makeover. Visitors are able to trace the story of the Cotswolds from prehistory to the late 19th century, through a series of galleries packed with a wealth of precious artefacts. The emphasis is on interactivity and making the museum accessible to as many people as possible. From jigsaws and handling objects, to touch screen terminals, a whole range of interactive equipment is now installed at the Corinium. We provided easy-to-use ContentIndex+ with an Image Library Module enabling the museum to create content for the interactive kiosks. New material can be created at any time, and is supplemented by data imported regularly from the installed collections management system. 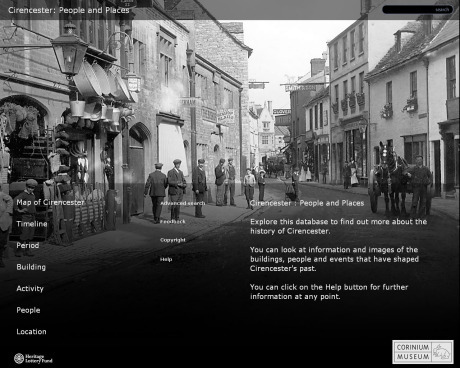 ContentIndex+ drives interactive touch screens in the galleries and visitors can search and explore 3,000 archaeological records and objects, or get to know old Cirencester through hundreds of photographs of the town. The systems enable the museum to design and provide more kiosk applications and to provide web access to selected materials as required.